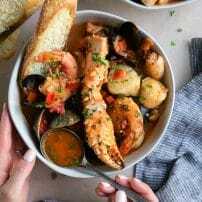 Cioppino is a comforting San Franciscan seafood stew filled with shrimp, clams, mussels, white fish, and crab legs simmered in a rich broth made from tomatoes, white wine, and fish stock. 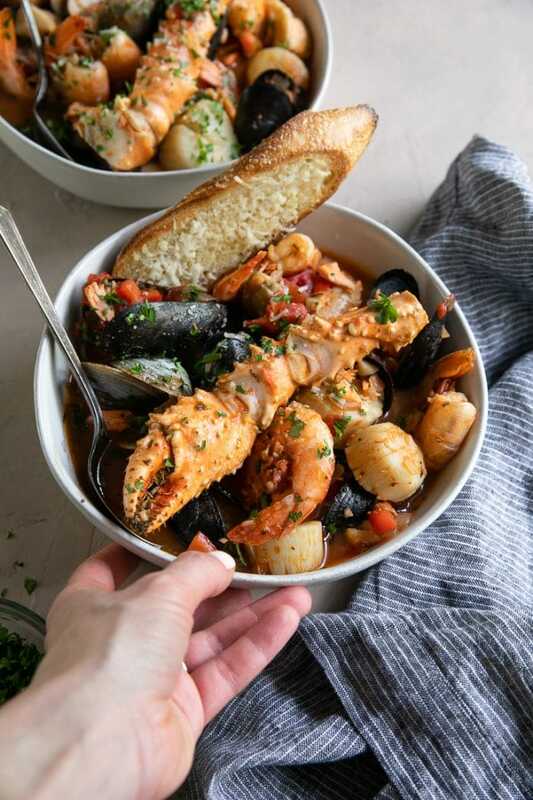 A family favorite, enjoy this easy and delicious one-pot Cioppino Recipe for a special weeknight or holiday meal. If you’ve never tried Cioppino then you are in for a delicious surprise. The best way to describe sitting down to a bowl of this seafood stew is that it is like sitting down to a happy, warm, comforting memory. Serve your big pot of amazing Cioppino with warm buttery mashed red potatoes. It will literally be the best thing you ever eat. Cioppino is an Italian-American dish originating in the 1880’s from San Francisco. Traditionally, Cioppino would have been prepared with whatever had been caught that day. In San Francisco, this would have meant Dungeness crab, shrimp, scallops, squid, mussels, and any fish that would have been caught in the Pacific ocean. The seafood is then combined with a deeply flavorful broth made from tomatoes and white wine. 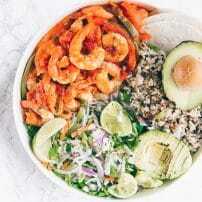 Its name, Cioppino, comes from the word “ciuppin“, the name of a soup with similar flavors but prepared with less tomato and with Mediterranean seafood from Liguria, Italy. What are the ingredients in Cioppino? What seafood would be added to authentic Cioppino? Any fish found in the Pacific- halibut is a popular choice. I tried to keep this recipe as authentic as possible, however, you’ll notice that added some salmon to the pot. While salmon is also found in the Pacific, it isn’t as “popular” given that it isn’t a white fish. Cioppino. Cioppino is made with a rich and comforting tomato-based broth made with local “catch of the day”fish and seafood native off the West Coast of California. Cioppino contains loads of seafood often served in the shell. Bouillabaisse. Bouillabaisse is a hearty French stew, much like Cioppino, but unique in that it contains saffron. The broth, while it contains some tomatoes, is not considered a true tomato-based broth. Other defining ingredients include white wine, potatoes, fennel, orange peel, and scorpion fish. Since scorpion fish is native to Provence, France, some say that true Bouillabaisse is only made in this particular location. Preparing Cioppino is super easy. 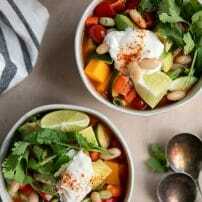 First, you’ll prepare the soup base which is made with a mix of vegetables, loads of tomatoes, white wine, and either fish or clam broth. 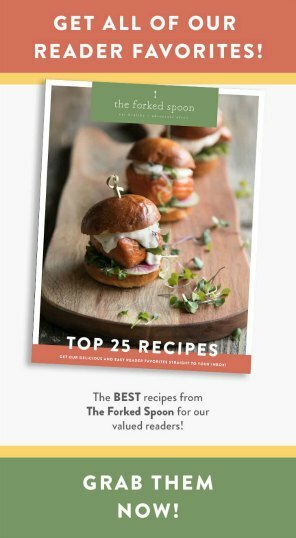 Not sure where to find fish and clam broth? You can find each of these pantry essentials at most major supermarkets in the canned tuna or seafood section. I don’t have a preference, so in the case of this Cioppino Recipe, I used one can of each clam and fish stock. Start with the veggies. The first step is to sauté the onions and shallots in olive oil. You don’t really want to scorch or brown them, but instead cook them slowly so that they’re nice and soft- about 5 minutes or so. You’ll then add the diced bell pepper and continue to cook, slow and low, for an additional 5 minutes. Don’t skip these ingredients. Next comes the garlic, tomato paste, and finally the white wine. 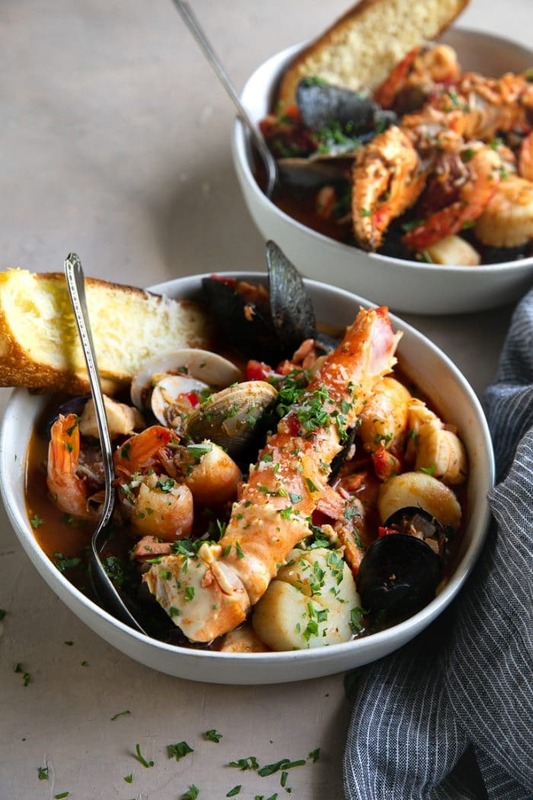 You really want each of these ingredients in your Cioppino Recipe (especially the wine), so unless you can’t have them for dietary reasons, go for it. Ok, so first add the garlic and sauté for a minute or so. Mix it up really well with the onions and shallots. Mix in the herbs and spices- oregano, Italian seasoning, salt, pepper, and crushed red pepper. Add the tomato paste. You’ll have to really mix it around to get it all mixed up with the onions. Stir continuously for 1-2 minutes before adding the wine…yes, all the wine and at least two cups. Tomatoes. Increase heat to high. 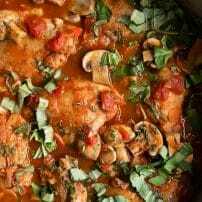 Bring the wine to a simmer and add the crushed tomatoes, bay leaf, and fish/clam broth. Mix it all together, bring to a low boil, and cover. Simmer for approximately 25 minutes. Here, at this point, you have your Cioppino stock. If you want to freeze it, do so now. The good stuff (jk it’s all good). 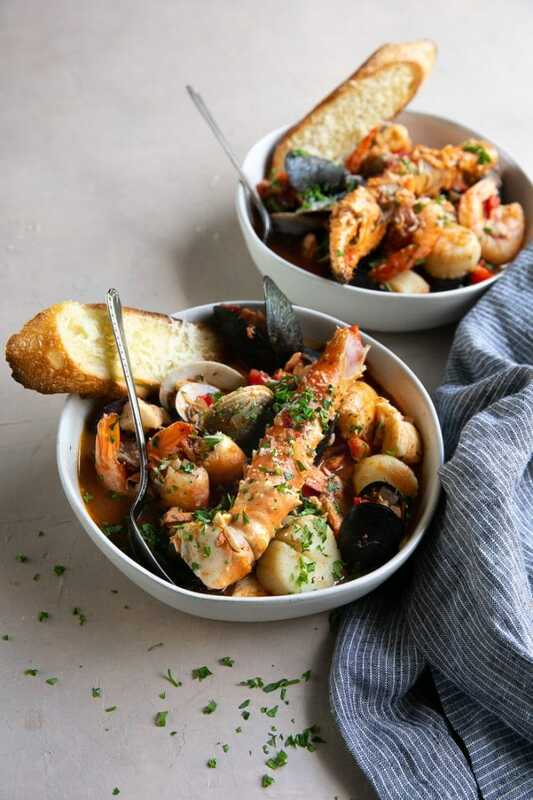 Once the Cioppino stock has been made, you can start adding any and all the seafood you want. I started with the clams and mussels. Add them to the pot, cover, and allow them to cook until shells have opened (approximately 5-10 minutes. Next, add the calamari and white fish, cooking for 5 minutes. Add the scallops and the shrimp and cover. Cook for approximately 5-10 minutes. Finally, add the crab legs. Since these are already cooked, you’ll only need to cook until they are heated through. What to serve with Cioppino? The traditional favorite is to serve Cioppino with crunchy hunks of bread. Now, there is absolutely nothing wrong with bread. I love bread. But there is something better. MASHED POTATOES. Yes, that’s me shouting in joy because I actually found a recipe that is made better when served with mashed potatoes (sorry, sweet potatoes, you don’t count here). 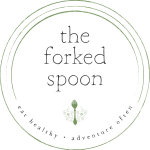 Seriously, the creamy mashed potatoes combined with the rich tomato wine broth will leave you speechless. I think it was this Cioppino recipe (plus the mashed potatoes) that finally convinced my husband to pop the question. Yes! At least in my personal opinion. In fact, I find that it tastes better the next day, or even two days later. Some people will argue otherwise since fish, especially shrimp, tends to toughen up the longer it is cooked. While in the case of shrimp this is most definitely true, I find that the overall flavor only gets better. My advise? When it comes to the shrimp and calamari, only add what you want to eat right away. It is true that the leftover shrimp does not taste as good. However, everything else? All good. Yes, the fish will flake apart, but that’s part of what makes the overall flavor of the broth that much richer the next day. Can you freeze leftover Cioppino? If you want to freeze Cioppino, I highly recommend doing so before the addition of any vegetables. Seafood that has been frozen, then cooked, then frozen, and then cooked again is not at its prime. So, freeze this recipe? Yes! But only freeze the Cioppino stock/broth without any of the added seafood. 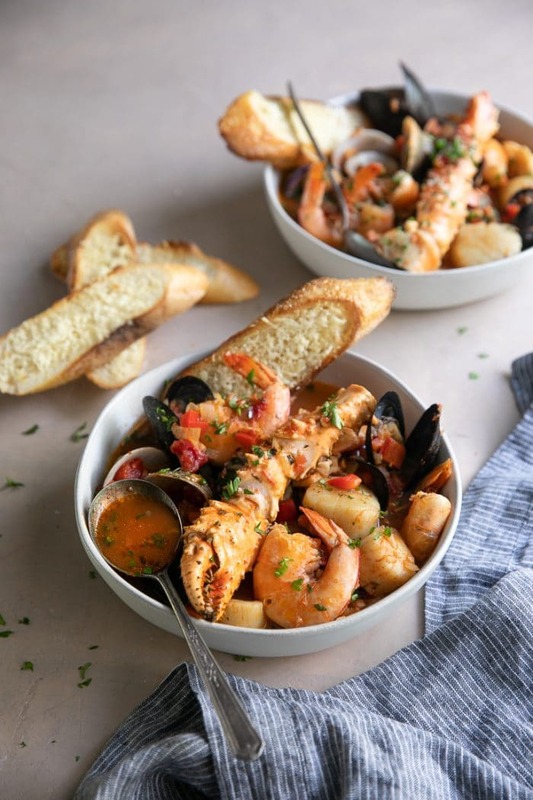 If you try cooking this Cioppino Recipe, please leave me a comment and let me know! I always love to hear your thoughts. 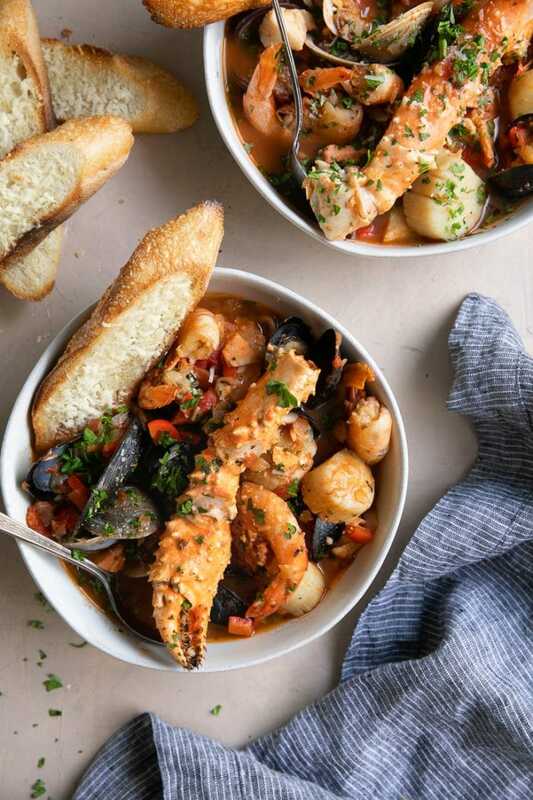 DON’T FORGET TO PIN AND SHARE THIS CIOPPINO RECIPE TO MAKE FOR A FLAVORFUL AND COMFORTING DINNER THE WHOLE FAMILY WILL LOVE. 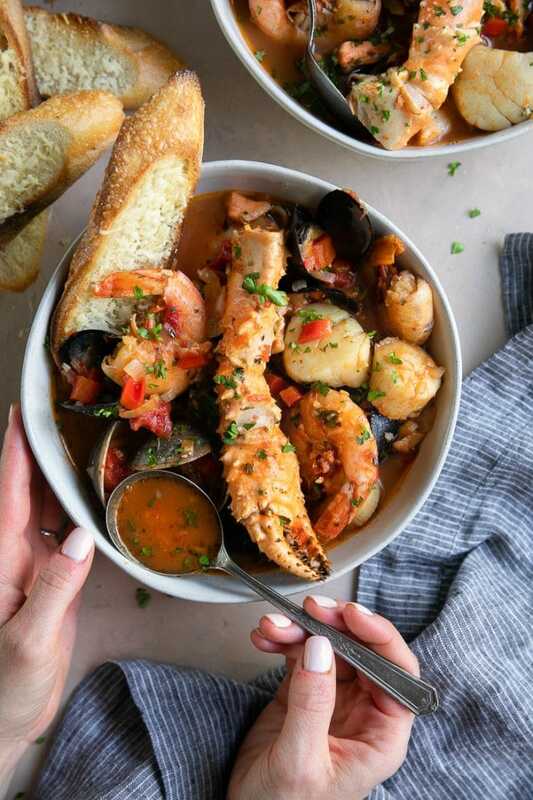 Cioppino is a comforting San Franciscan seafood stew filled with shrimp, clams, mussels, white fish, and crab legs simmered in a rich broth made from tomatoes, white wine, and fish stock. 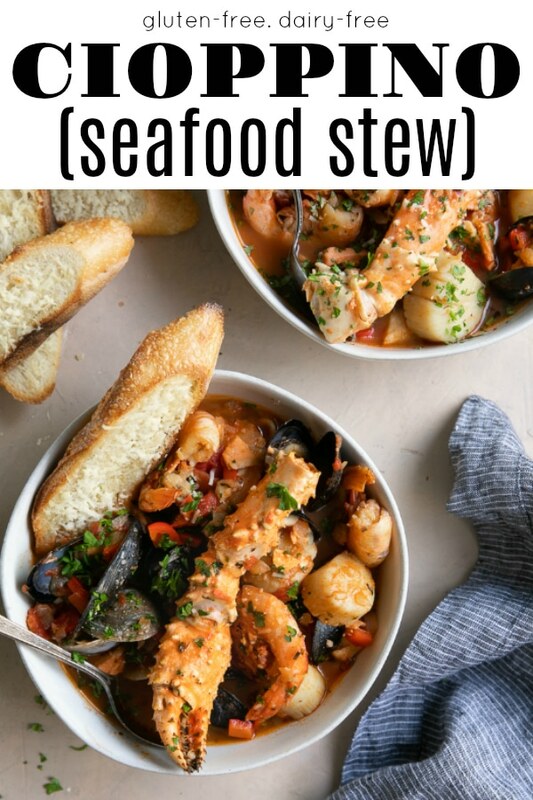 A family favorite, enjoy this easy and delicious one-pot seafood stew recipe for a special weeknight or holiday meal. Add the olive oil to a large pot or Dutch oven over medium heat. Add the onion and shallots and mix well to combine. Sauté for approximately 5 minutes, or until the onions start to soften and turn translucent. Stir often. Add the diced bell pepper to the onion and continue to cook for 4-6 minutes, stirring often. Add the garlic and sauté, stirring continuously, for 1-2 minutes. Stir in the dried oregano, Italian seasoning, salt, pepper, and crushed red pepper and mix well to combine. Mix the tomato paste with the cooked onions, mixing well to combine and stirring constantly to prevent burning. Allow the tomato paste to cook with the onions for 1-2 minutes before adding the white wine. Increase heat to high. Add the crushed tomatoes, bay leaf, and fish/clam broth. Mix well and bring to a low boil. Cover and reduce heat to low. Simmer for approximately 25 minutes. Add the clams and mussels to the pot, cover, and cook until the clams and mussels begin to open (approximately 5-10 minutes). Discard any clams and mussels that do not open. Add the calamari and fish and cook for 5 minutes, gently mixing to combine. Next, add the scallops and shrimp, and cook, covered, for 5-10 minutes. Last, but not least, add the crab legs to the pot and cook for 5 minutes, or until heated through. Season with additional salt and pepper, to taste. Garnish with fresh chopped parsley and fresh parmesan cheese and serve with crunchy toasted buttery bread, or, mashed potatoes (not traditional, but amazing!) Enjoy! If you would like to freeze Cioppino, I recommend freezing the broth before adding any fish or seafood. This recipe stores well in the refrigerator for up to 3 days. I’ve got a question about the stock and re-heating etc. You said that the taste the next day or even the second day is even better. Which I totally agree on. So could I make the brought and leave that for a day so all the flavours really develop. And add all the fish the day I would like to eat it? Or is it necessary for the taste to come into its own with the fish already added? I’ve never made this before, but I’ve been looking into a lot of recipes the last couple of days about this dish. 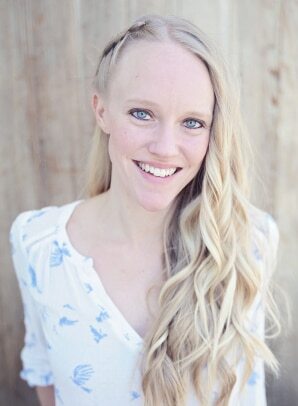 So I’m really excited about yours! Great question! I would recommend in this case cooking the salmon and white fish the day before and leaving all other seafood to cook the day of serving.